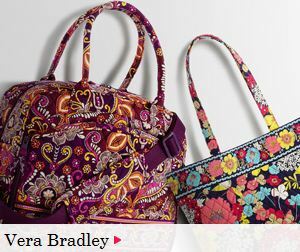 If you are a member of Rue La La you may want to check in on the Vera Bradley Sale going on. They have lots of different bags, coin purses, wallets and even flip flops in different styles, but you may want to hurry as items are selling out fast. If you aren’t a member yet, you can join Rue La La HERE. If you aren’t familiar with Rue La La- they are an invitation only deal site that offers big discounts on fashions for Women & Men, shoes, accessories, Travel, Home Goods & much more. Shipping is $9.95 on orders, but when you order, you then get shipping FREE on anything you buy for 30 days. I really love RueLaLa- their site is so clean, neat and organized, and they have some wonderful high quality merchandise at great prices. I have been very happy with the things I have ordered from them in the past. You can check out Rue La La HERE. You also can earn a $10 Credit when you invite friends to Rue La La when your friends first purchase ships. Once you are logged in, look for “Invite” at the top of any Rue La La page, then you can send an email invite or use your personal invite link. My invite link is the one I am using in this post, but feel free to share your invite links in the comments! Kerry, thank you for letting everyone share. Very kind & generous. Rue La La is one of the few places to get gorgeous leather purses at an affordable price.